Musée des égouts de Paris. ABOVE: Exhibits in the Eugène Belgrand Gallery, named after the engineer who designed the present-day Parisian sewer network in 1850. From the floor of the gallery, you can look down into the waters of the Bosquet sand trap. Sewers have been draining wastewater in Paris since the beginning of the 13th Century, when the city's streets were paved and drains were built on orders from Philippe Auguste, the king of France from 1180 to 1223. Covered sewers were introduced during the reign of Napoléon Bonaparte, and today's network of more than 2,100 km (1,312 miles) of sewer tunnels was begun in 1850. 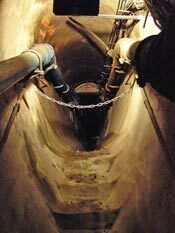 The sandstone tunnels carry drainwater from the streets, sanitary sewers (now in separate pipes), mains for drinking water and the water used for streetcleaning, telecommunications cables, pneumatic tubes between post offices, and (or so one assumes) the occasional rat. Today, the carts and boats are gone, having been replaced by an even better attraction: the Musée des égouts de Paris, or Paris Sewers Museum. This museum of the Mairie de Paris is located in the sewers beneath the Quai d'Orsay on the Left Bank, and it's a "must see" destination for any visitor who's interested in engineering, public works, or unusual tourist attractions--and for fans of Victor Hugo's novel, Les Misérables, and the musical that it inspired. LEFT: A sandstone tunnel brings stormwater and sewage from a nearby street. After descending the stairs from the aboveground ticket office, you'll enter a long gallery beneath the Quai d'Orsay that runs parallel to the Seine. Here, you can see pipes and a five-ton "flushing boat" in what once was the main sewer line between the Place de la Concorde and the Pont de l'Alma. You'll pass a large basin that traps solid material from wastewater (the sewers recover more than 15,000 cubic meters of grit per year). At the end of the tunnel are a footbridge and a feeder sewer fom the rue Cognacq-Jay (see photo above); from there, you'll head right to the Belgrand gallery, the main exhibit area of the museum, which is built above the sand trap of the Bosquet main sewer that runs to the Ecole Militaire near the Eiffel Tower. Tip: Allow 60 minutes for your visit, or longer if you want to spend time in the gift shop. 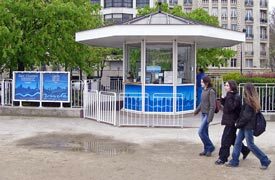 ABOVE: The museum's ticket kiosk is at ground level. A staircase leads down to the sewers (see small inset photo below). 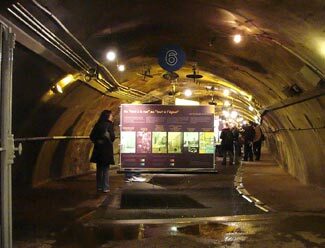 Hours and tickets: The Paris Sewers Museum is open daily except Thursday and Friday. From May through September, hours are 11 a.m. to 5 p.m.
From October through March, hours are 11 to 6 p.m. Please note: The museum is normally closed on Christmas and New Year's Day, and for two weeks of maintenance in January. Holders of the Paris Museum Pass get in free. Tours: Guided tours are free when available; foreign-language tours are offered only in the summer. You can easily explore the museum on your own, using the free booklet that you'll be given with your ticket. Metro: The nearest stop is Alma-Marceau (line 9) on the Right Bank; after leaving the station, cross the river to the Left Bank and turn left at the Quai d'Orsay. RER: The Pont de l'Alma station of RER Line C is very close to the museum. (Line C runs underground along the Seine with stops at St-Michel, the Musée d'Orsay, and Invalides on its way to Pont de l'Alma.) From the station, cross the Place de la Résistance and follow the left side of the Quai d'Orsay to the museum. Handicapped access: The museum doesn't have an elevator--just a staircase with 42 steps that leads from street level to the sewers. The city's official Web site has information about the sewers, a video, and current details about admission fees and visiting hours. French, English, and Spanish versions are available.